Study these facts for the Math test on Tuesday. I am 3.14 decades from mastering my craft as a teacher. 592 more essays to revise before I can save 65 students from misusing commas. The length of 35,897 staff meeting doodles can stretch across the equator 932 times. 38,462 Domino’s pizzas are served in 6,433 cafeterias every Friday for school lunch. There are 832 different texts in my school’s 79 square foot library. 509 students are interacting through Xbox right now. 8 of my students are writing poetry on a Friday night slamming the 841 ways a heart can break. There are approximately 97,169 minutes until graduation and 3,992 dreams that will change, expire, birth and evolve before then. 75 pages of Watership Down are assigned for Wednesday’s class, but the students have to answer 1,058,029 test questions between now and then so only 7 will come to class prepared. There are barely more than 49 months before this year’s eighth graders will be trying on their gowns and mortarboards for the greatest day of their life. 44 students are existentialists contemplating their place in life and overlooking the 592 parallel universes in which their individual dramas play out in life. 30,781,640 people in this country believe that evolution should not be taught in schools and 6,286 people believe Noah will run for Vice President on Adam’s ticket in the next election. 208 school districts being seduced by 99 lobbyists are affecting exactly 8 positive outcomes for education. Sometimes I wish only 6 more students would care to learn about the power of a persuasive essay. 2,803 more minutes are about to slip away from my life before this exercise ends. 3,482 parents have to take on second jobs each school year directly resulting in 53,421 uncompleted homework assignments. I have on good word that all 17 people in my classroom will go on to create positive change in the world and 0 will forget my name. On a good day, 679 synapses fire back to grade school when I teach about suffixes and prefixes. I leave school every day wishing I could do 82 things differently tomorrow. The 14 people working in my high school defy 808 impossibilities every morning. I believe in the number 65. I do. Did you know the number 132 is a pronic number, the product of eleven and twelve? Interstate 82 connects Ellensburg, WA and Umatilla, Oregon. And 30 kindergarten students would laugh at the word Umatilla. And probably 6 high school juniors would too. The average college student today will pay upwards of $64,709 on college tuition at a public university. There are exactly 38 United States capitals that my students are aware exist. I am sorry, Dover and Augusta. 44 is a pretty number. 609 is the area code of South Jersey, the capital of American shore pines. 55 students are truants every day in order to homeschool themselves. 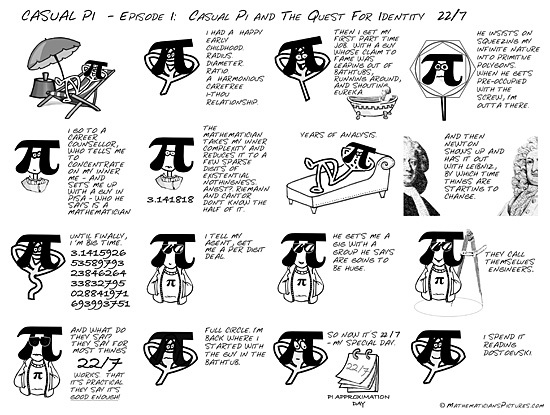 Exactly 0 people are excited about π at this point. Somewhere around 58,223 I lose count. March 17 is the only day of the year until I get to wear an Irish tie without being obnoxious. And even then, there is a 25% chance I will be 35 times more obnoxious than the 940,812 other teachers wearing similar ties. There are approximately 848 more poems to write about teaching this March, of which only 11 of them will be worth reading..
74 people will obtain four-year college scholarships and spend a 5th year of college on their own dime because they want 0 of the real world. There are 28 days of February and nearly 410,270 teachers go crazy during this time. In 1938, John Dewey published a seminal book on education and less than 5,211 educators know this man other than the Patron Saint of Librarians. 0 people believe 555 is a legitimate area code in movies. 9,644 teachers are currently considering the 6 ways they could do something other than teaching with their lives only to show up for the next 22 years in order to reach retirement age and cash in on those 9 golden years before realizing they’ll need to continue working for the next 489 years. ’54 is the year of a landmark case made real a few years later when black girls like Minnijean Brown became women in Little Rock, and 930 months later in the third decade of this century, 38,196,442 students will still deal with inequalities with their education. My 88 year old grandfather fought approximately 1,097 days in the Pacific during WWII. 5665 is a palindrome and 9 thousand people mistakenly think 3344 is one too. The release of Highway 61 influenced a generation of Americans to believe Bob Dylan is our greatest American troubadour in need of revisiting. 28 is the second mathematical perfect number, with two of its factors being the neat and tidy 4 and 7. You can’t make that stuff up.